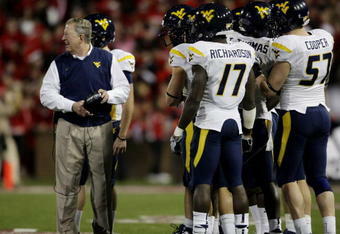 The West Virginia athletic department rolled out their coaching plans for the football program on Wednesday. Oklahoma State offensive coordinator Dana Holgorsen was announced to the same position with the Mountaineers today. It is reported his new six-year contract is worth $800,000 the first-year and will then increase to $1.4 million plus incentives. Holgorsen will replace Jeff Mullen and become the “coach-in-waiting” when Bill Stewart steps down following the 2011 season. The Mountaineer offense was simply average this season. The offense averaged 377 yards per game and never could find a consistently effective way to use the many talented players on the roster. In one year in Stillwater, Holgorsen’s Cowboy offensive led the nation in total yards per game. The former Houston offensive guru has now transformed the likes of Case Keenum, Kendall Hunter and Justin Blackmon into household names. West Virginia rolled into this season with high expectations, only to finish slightly behind Connecticut for the Big East automatic BCS berth. Holgorsen won’t join his new team until after the Mountaineers battle North Carolina State in the Champs Sports Bowl on December 28th. Stewart is planning on taking an administrative roll following the 2011 campaign. The succession plan in place has the possibility of turning out many different ways in the upcoming year. In Austin, Will Muschamp was the “head coach in waiting” for several years until finally landing at Florida. Jimbo Fisher finally got his chance to take over for Bobby Bowden in Tallahassee this past season. Two years ago, Mike Bellotti accepted the position of athletic director to make way for Chip Kelly to lead the Ducks. One thing is for sure, the folks in Morgantown need a bolt of excitement following the departure of Rich Rodriguez. Victories, ticket sales and electric plays have declined steadily after Stewart took over. Stewart is 28-11 since taking over for the much hated Rodriguez. Hopefully for Hologorsen, a year of easing into his new role will give him a chance to rebuild the Mountaineer offense and instill some much needed hope in a fading fan base. ~ by philip d. on December 16, 2010. This entry was posted on December 16, 2010 at 9:43 am and is filed under NCAA Football, Oklahoma State Cowboys, West Virginia Mountaineers.You can follow any responses to this entry through the RSS 2.0 feed.You can leave a response, or trackback from your own site. Next: One Long Decade: Can the ACC Ever Return to the National Stage?